Linen weave finish with deckled edges and foil border accent holds two photos side by side. Optional custom imprinting available. Linen weave finish with deckled edges and foil border accent holds two vertical 4x5 photos side by side. Optional custom imprinting available. This item has a 4 pack (100 folder) minimum and requires 5 business day production time before shipping. No returns or exchanges. Linen weave finish with deckled edges and foil border accent holds two vertical 4x6 photos side by side. Optional custom imprinting available. 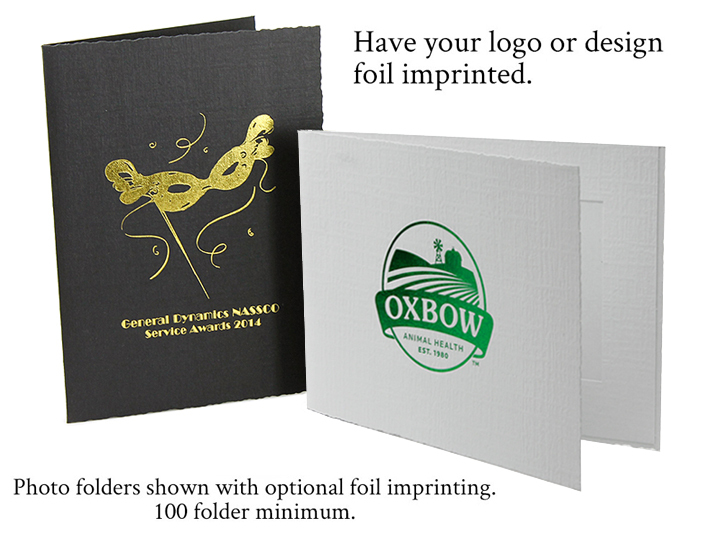 Black Folders - Non-imprinted ground orders usually ship in 2-3 business days. White Folders - 4 pack (100 folder) minimum, 5 business day production time and no returns or exchanges..
Linen weave finish with deckled edges and foil border accent holds two horizontal 4x6 photos side by side. Optional custom imprinting available. Non-imprinted ground orders usually ship in 2-3 business days. Exception - Black w/Black Foil - 4 pack (100 folder) minimum, 5 business day production time and no returns or exchanges..
Black w/Gold Foil - Non-imprinted ground orders usually ship in 2-3 business days. All other styles - 4 pack (100 folder) minimum, 5 business day production time and no returns or exchanges..
Frame all your photos and prints just like a professional studio photographer. 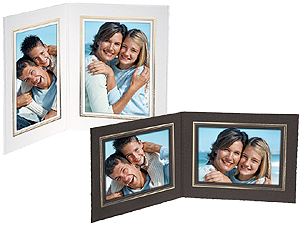 Portrait Folders with foil borders are suitable for a variety of photographs including: Senior and school portraits, family portraits, engagement and wedding portraits, cruise and resort photography. Also great for before and after photos.